Want to add a pop to your next outfit? Not only known for her bags, Tory Burch makes some beautiful jewelry that is fun for many occasions. How do you plan on accessorizing this summer? Hermès never ceases to impress. In addition to scarves, my other favorite collectibles are enamel bracelets! The fun thing about collecting the narrow enamels is that they are easily stackable to create a classy, eclectic look. And they seriously stand up to daily use. I wear my Brandebourgs enamel daily, and you can't tell its age (almost one year old). Part of the Fall/Winter 2012 collection, the Balcons du Guadalquivir bracelets are on their way out. So if you love this pattern and see it in the boutique, I'd highly suggest pulling the trigger on the purchase. This piece matches a scarf and handbag combo that I've been trying to further accessorize. Points for any readers who can point out the designer/collection that the bracelet rests upon in the comments! It was nearly a story of love and loss, because I almost waited too long! It was the last in my size. Without flinching, I said to my wonderful SA, "This was meant to be!" What are your favorite accessory collectibles? The past week was spent at the International Consumer Electronics Show (CES) in Las Vegas, NV. Despite lots of walking and producing, I had some time to spend on the strip, and I grabbed something special from CityCenter's Yves Saint Laurent store. Yes, it does still say YSL on the store, and nearly everything in there is on sale! If you're anywhere near Vegas, head to the YSL store there for some good deals before all the new Saint Laurent Paris merchandise is stocked. They do have the new Cabas ChYc bags there as well as the old ones. But back to the subject...after visiting Louis Vuitton, I moved over to Yves Saint Laurent and spotted the beautiful Arty rings and bracelets. Always an appreciator of the trend, I decided to try on as many as possible! (Insert sly smile here.) The colors available were incredibly beautiful and vivid. From turquoise blues to gold-filled corals, deep woody browns, blacks and greens, the Artys dazzled me. Keeping true to myself, I found the perfect subdued gold Arty ring. I do admit to being extremely obsessed with neutrals, so this ring completely fit in my accessories collection. Decorations are up! The chill is in the air (well, at least in the northeastern United States), and holiday music is abound throughout every radio and store. School isn't quite over yet, but I couldn't be more ready for the holiday season--and break from class of course. I was looking to write a special holiday feature a few months ago, but wasn't quite sure about what to feature. Luckily, the lovely Rachel Reinhardt and I came into contact from an earlier post about her beautiful turquoise multi-strand necklace, and everything fell into place. 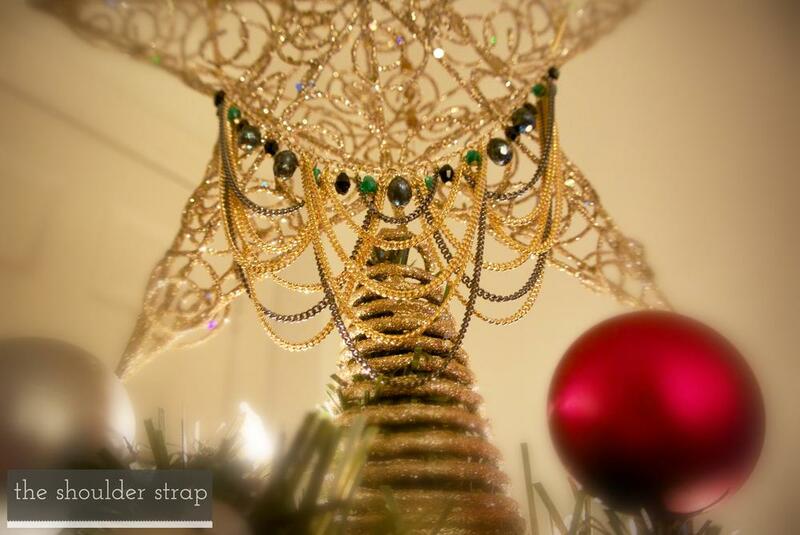 I am more than happy to feature one of her beautiful, hand-made creations for The Shoulder Strap's 2012 Holiday feature. Scroll down to the bottom to read an interview with the designer herself! This absolutely gorgeous "Layered Mixed Metal Swag Necklace" is designed and hand-crafted in the USA by Rachel Reinhardt Jewelry. 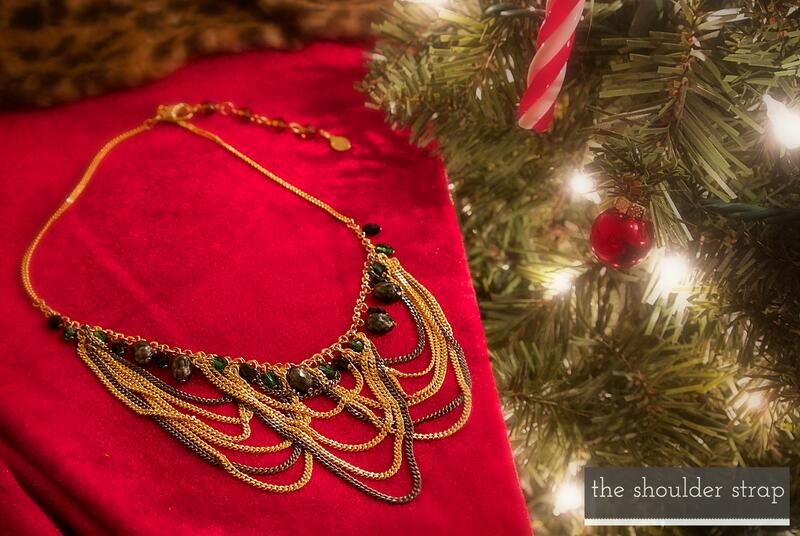 From the Ashley line of her 2012 Holiday Collection, this draped necklace is quite exquisite. The golden hematite chain is strong and sturdy, and is worn very comfortably against the skin. Unlike other statement-piece necklaces of mine, this doesn't weigh heavily upon my neck. It is very delicate and precious, with elegant freshwater pearl and crystal stones . It stood out to me the second I viewed it from her Holiday catalog. Something certainly beautiful to give to a friend or loved one this holiday season. Rachel's jewelry has been featured often in publications like 'Glamour', 'InStyle', and 'Us Weekly'. Rachel Reinhardt Jewelry is available for purchase in over 250 specialty stores worldwide and on her website, www.rachelreinhardt.com. Please see below for an exclusive interview with Rachel! We had the opportunity to speak with jewelry designer, Rachel Reinhardt, about her brand, her family and beautiful aesthetic. What drives you in your creations? What keeps you motivated as a jewelry designer? I just simply love what I do. I find inspiration wherever I go. Whether it's the produce section of the grocery store admiring the ruby tones of apples or the emerald skin of a cucumber. It's there that I often find my most beautiful color combinations for my collections. Sounds silly but it's true. My late mother's voice keeps me motivated. We started this journey almost 20 years ago together and unfortunately she only lived for 4 years of them. She passed me the baton and I will never stop and I will always be forever grateful. What are your favorite materials to work with and why? How would you describe your aesthetic? Our collection has always been known for its color combinations and details. We will often put a crystal or glass bead next to the finest semi precious stones. For us, it's about creating that beautiful balance. Our aesthetic is feminine and wearable. I love to work with anything that has a sparkle and feels luxurious. What advice would you give to anyone desiring to break into the fashion/jewelry industry? How do you see your brand evolving in the next ten years? My hope and belief is that we will continue to create a brand that women can wear and feel glamorous doing so. I love when I meet a customer and they tell me they are a collector. What an awesome feeling. If I can continue to move along that path my work along with my children and husband will continue to be my greatest joy! STAY TUNED IN A FEW DAYS FOR A SPECIAL PROMOTION WITH RACHEL REINHARDT! NB: Disclosure of Material Connection: This is a “sponsored post.” Rachel Reinhardt Jewelry compensated me via a gift of the beautiful necklace seen above. Regardless, I only recommend products or services I use personally and believe will be good for my readers. I am disclosing this in accordance with the Federal Trade Commission’s 16 CFR, Part 255. Every fashion lover should have a timepiece that is elegant and yet appropriate for everyday casual outfits. 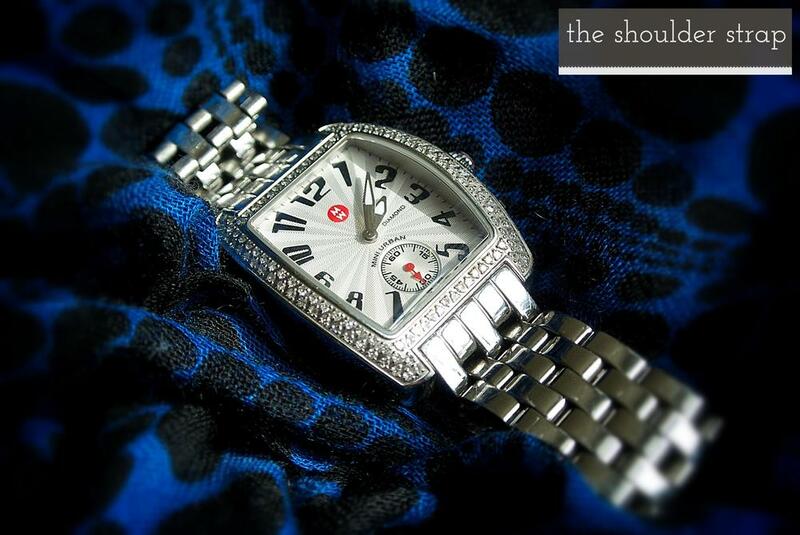 Michele makes watches that are casual, fun, dressy and elegant. Remember this Tahitian Jelly Bean? This is just one of many styles, but this Mini Urban with diamonds stood out to me as a great watch to start a timepiece collection. What is nice about this is that it has a very subtle "bling" to it.... ;) There is nothing nicer than subtle bling. What's going to be your holiday timepiece this season?